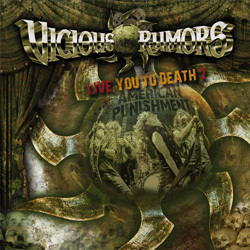 New releases in 2014 are hotting up faster than a barbecue on Bondi Beach, and the biggest scorcher around at the moment is ‘Live You To Death 2 – American Punishment’, the latest offering from Vicious Rumors. An album so blistering it’s damn near a fire hazard ‘…American Punishment’ takes on where 2012’s original ‘Live You To Death’ left off, picking up the (murder)ball and running with it and in doing so blazing – as an old sage once said – a trail of destruction that’s second to none. What sets Vicious Rumors aside from the rest of the metal pack is guitarist Geoff Thorpe’s and drummer Larry Howe’s seemingly unswerving loyalty to, and refusal to diverge from, the true course of metal. Almost thirty years have passed since their debut album ‘Soldiers Of the Night’ was released and although fads in metal have come and gone, governments have fallen and new countries born, Vicious Rumors have ridden every wave, taken every beating and still come out stronger and heavier than before. You know, before you even press ‘play, that any release bearing the VR name is going to a huge wall of guitars and pounding rhythm section, immense in both shape and form, and, believe me, ‘…American Punishment’ is no exception. The trick in the tail this time around is that – and the clue’s in the title – whereas ‘Live You To Death’ was recorded in Europe, the new album captures Thorpe, Howe and their comrades-in-metal Bob Capka, Nick Holleman, and Tilen Hudrap as they raged their way across the States on last year’s ‘Electric Punishment’ tour. And if the original ‘Live You To Death’ set the bar then ‘…American Punishment’ ups the ante; a relentless, larger-than-life tour de force, ‘…American Punishment’ is not so much a CD as an adrenaline junkie – can’t be stopped, can’t be beaten, and probably can’t be bettered. Perhaps the biggest surprise is that despite the strength of their recent material the first four cuts on ‘…American Punishment’ recreate Side One of the their 1987 ‘Digital Dictator’ album – which, for the uninitiated, is no bad thing in itself; ‘Digital Dictator’ is one of those albums that every home should have – the title track’s a monster, and it’s impossible not to get swept along with the flow given the power and passion of the likes of ‘Lady Took A Chance’ and ‘Towns on Fire’. Only after yet another cut from ‘Digital Dictator’ (‘Worlds And Machines’) do the band rampage backwards and forwards through their back catalogue. But with only ‘I Am The Gun’ and the title track itself coming from ‘Electric Punishment’ ‘…American Punishment’ showcases perhaps some less well-known releases, and in particular the three cuts from the band’s 1990 self-titled outing (‘Don’t Wait For Me’, ‘World Church’ and ‘Hellraiser)’ are all joys to re-discover. OK, there are a few tracks duplicated over both releases, but so what? ‘…American Punishment’ and its ‘Live You To Death’ predecessor are two halves of the same coin and for the ultimate metal workout try playing them back-to-back: just don’t forget to breathe. And besides, you’d have to have ears of stone not to rate ‘Digital Dictator’ as one of the greatest, chest-beating, neck-wrenching metal anthems of all time. Bands like Vicious Rumors bring metal to life – they’re the real deal, big and brash, ebullient and effusive; no compromises, no surrender. What’s not to like?